There can be little doubt that the galley is the longest running design for a military ship in nautical history. With few critical changes, variations on the design existed from at least 3rd Millennium BC Egypt to 19th Century Eastern Europe. A lifespan in excess of four thousand years is pretty impressive. Galleys throughout history have taken much the same form: a forward firing platform, a rear housing, and between them row upon row of oar benches with a narrow passage between them. This design (especially taking into account the ram at the fore) made the front a powerful attacking force in combat, but the sides, with no defences and bearing only the oar banks was a vulnerable point. The result of this was a reliance upon formations among fleets that allowed multiple galleys to protect one another’s flanks, a tendency that informed the tactics of galley fighting for millennia. One of the largest galley-type vessels ever built (according to Athanaeus) was that of the Graeco-Egyptian pharaoh Ptolemy Philopator. This immense vessel was a catamaran-style twin-hull, 130m in length (as opposed to the largest Roman vessel, the quinquereme, at 45m), had 7 rams (as opposed to 1), 480 oars with 4000 rowers (as opposed to 180 manned by 300 rowers). Sounds info-dump and not exciting? Then picture a twin-hulled, catamaran-style oared galley twice the size of HMS Victory (Nelson’s flagship) and with a crew complement larger than any aircraft carrier ever built! Now, how’s it look? The heights of galleys could vary. John of Austria had the beaks of his galleys removed so that his forward facing central guns could achieve a low enough trajectory to fire on his Turkish enemies. Worth noting here also is that young John was a tender 24 years of age when he commanded his fleet of 213 vessels against the power of the Ottoman navy in an engagement we will get to later on. Back in 56 BC (and in Marius’ Mules III! ), the Romans found themselves in war against the Veneti, a seafaring tribe on the Biscay coast of Brittany. In their first few engagements the Romans quickly discovered that the Veneti’s ships were too high and solid for Roman galleys to easily overcome by ramming, and their large sails and affinity with the sea allowed them to out-manoeuvre the Romans when needed. The Roman commander, Decimus Brutus, managed to solve the problem by attaching hooks to long poles so that when the ships closed, the Roman sailors reached up and raked the Gallic sails, rendering the Veneti ships immobile and helpless and allowing the ever-efficient Romans to board them and achieve victory. The design of a galley left no room for leisure or comforts. The entire deck was taken up by rows of oar seats, fighting platforms, steering sections, artillery, masts and so on. This meant that there were no permanent above deck structures on a galley. The only shelter available was in the fairly limited hold below deck or temporary tent-like structures that were raised at the stern as required. One of the most brutal and decisive galley-led battles in naval history occurred off the island of Djerba in southern Tunisia in 1560. The Ottoman fleet under Piyale Pasha and Turgut Reis, with 86 vessels, faced an alliance of Spanish, Maltese and the Italian city-states with in excess of 200 ships. The Turks took the Christians by surprise and achieved a resounding victory in a matter of hours, sinking 60 ships as opposed to only a small number of their own, the casualties being roughly 10 Christians to every Turk! The different types of galley were more often than not defined simply by the number or oars, the number of oar banks, and the number of sailors on each oar. This has led to more than the well-known biremes, triremes, quadraremes and quinqueremes of the Roman world, but also the liburnian (a light bireme), the Ottoman kadirga (with single banks of oars and with varying rower numbers but with a unique sail configuration) and many others depending upon regional requirements. Galleys were short range, day-trip vessels. The lack of living space and storage room for provisions meant that only essential supplies and water for the oarsmen could be kept aboard. This limited operation to a day, and therefore galleys rarely strayed far from the nearest coastline, putting in for the night. Though it is tempting to think of galleys as either an ancient world phenomenon or a Mediterranean or Baltic thing, it will probably surprise most Brits to discover that Britain has been the target of numerous attacks and landings involving galleys over the centuries. Julius Caesar used them twice to land in Kent, several Spanish galleys were captured in battle at Winchelsea in Sussex in 1350, the French used them in the Battle of the Solent, which saw the sinking of the Mary Rose, were part of Spain’s armada in 1588, and even bombarded Penzance in 1595. 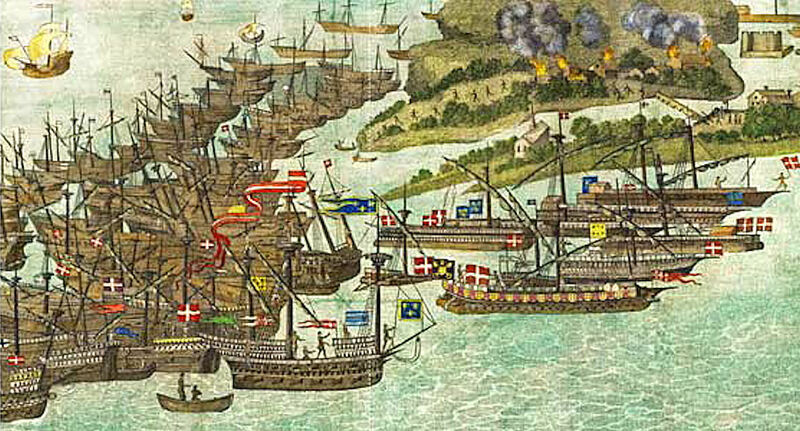 The most famous engagement of galleys since the end of the ancient world is the Battle of Lepanto, fought between the Ottoman Empire and the ‘Holy League’ of the western Mediterranean off the coast of Greece in 1571. A crushing victory for the Christians, this battle was the engagement that put a stop to Ottoman expansion to the west, and was also the last time a Mediterranean sea battle would take place between galley-based fleets. As an interesting side note, one of the Spanish combatants in the battle was Miguel de Cervantes, who would later find fame as the author of Don Quixote. Galleys (or in Turkish: Kadirga) were the stock vessel of the infamous Barbary pirates, such as the dreaded Hayreddin Barbarossa. From the late 15th century until the 18th, these vessels were a feared and all-too common sight around the western Med. Operating from Ottoman controlled ports in North Africa (the Barbary coast), Turkish galleys raided so freely and with impunity that Spain went to the trouble of fortifying their coastal churches and building watchtowers around their entire coast at mile-long intervals. My novel The Priest’s Tale involves the first flowering of this feared force. Polybius tells us of one Roman invention that dates from First Punic War. The ‘corvus’ (raven) was a hinged bridge fitted at the prow of a Roman galley, with a bird’s-beak-shaped spike beneath the outer edge. As the Roman vessel rammed a Carthaginian ship, the bridge could be lowered, the spike sticking into the deck and allowing a relatively-stable boarding platform to overcome the enemy ship. The effectiveness of the weapon is questionable, given the drawbacks on heavy swells, but it marks yet another Roman advance in galley-based war. Salamis! No, not a collection of northern Italian sausages, but one of the most famous sea battles in world history. Fought off the coast near Athens, this entirely galley-based action between the Greeks and the Persians in 480BC, aided by the famous defence of Thermopylae by 300 Spartans, effectively ended the Persian invasion of Greece which until this point had looked unstoppable. Despite being outnumbered and outclassed, Greek tactics won the day as they lured the Persians into a small bay where the weight of numbers made no difference, and they resoundingly smashed the fleet of Xerxes. 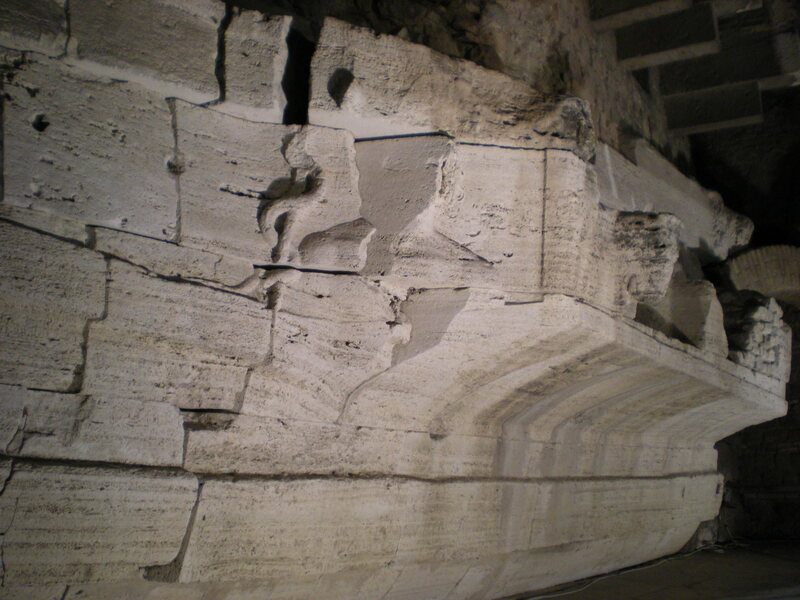 One of the most feared weapons of the ancient world could be found on the prow of the Byzantine Dromon. ‘Greek Fire’, though its precise makeup is uncertain, was essentially the napalm of the ancient world. A liquid fire that burned even on water, such a weapon could be dangerous to the wielder on board a wooden vessel, but if used right (fired from a tube according to evidence) it was brutal and deadly against enemy shipping. Imagine the effect of napalm on a timber vessel! 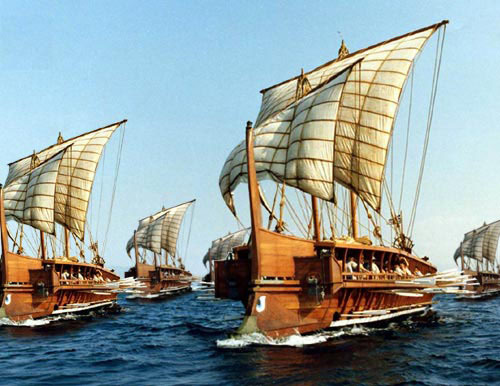 Though they are easily considered ancient or medieval vessels, the last galleys built were surprisingly recent. In 1796 the last galley class vessels were constructed in Russia as part of Catherine the Great’s forces in the coalition against the French Empire, and these vessels were yet to see military action. Polybius (that great and informative storyteller of the ancient world) has a last nugget for us. Those of you who have studied the Romans will recognise their tendencies toward innovation rather than invention, and this tendency was never better illustrated than in the case of war with Carthage. 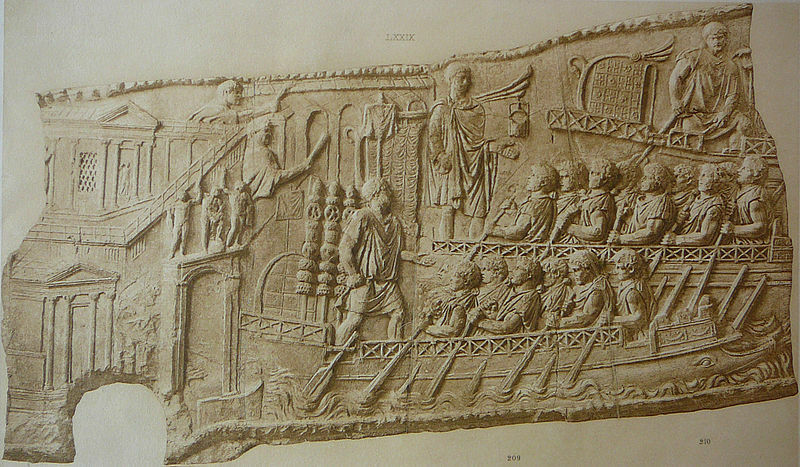 Rome had been repeatedly chastised by the Punic fleet, whose ships were bigger and better. Polybius tells us: “On this occasion the Carthaginians put to sea to attack them as they were crossing the straits, and one of their decked ships advanced too far in its eagerness to overtake them and running aground fell into the hands of the Romans. This ship they now used as a model, and built their whole fleet on its pattern”. In short: a shipwrecked Carthaginian quinquereme formed the blueprint for the new Roman fleet which would turn the tide of naval war against Carthage. In the mid-15th century BC the Pharaoh queen Hatshepsut sent a five-galley fleet to exract taxes and oaths of allegiance from the fabled land of Punt somewhere south of Egypt (possibly in the Somalia/Eritrea area.) The images of these ships are still to be seen on her temple at Deir El-Bahri and are among the earliest recorded pictures of galleys. 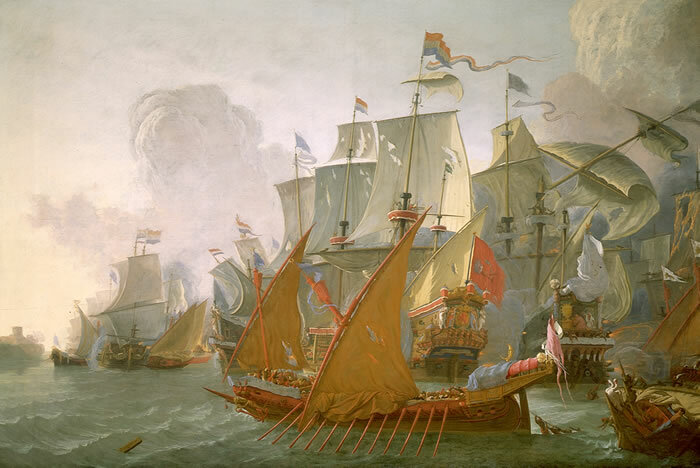 The battle of Actium in 31 BC remains one of the most famous sea battles of the ancient world. It also marks the high point of the Roman fleet’s value as, from this point on, the Roman navy becomes more of a troop-transport and pirate-control force than a military fleet. The final naval action of the Republic and the end of the civil wars, Actium saw a Roman fleet under Antony and Cleopatra thoroughly smashed – through a combination of misfortune, misinterpreted signals, betrayal and panic – by a roughly equal Roman fleet under Octavian and Agrippa. This victory heralded the rise to unrivalled power of the man who would become Rome’s first emperor. Despite the early era of the majority of galley action, the last battle seen by a galley was actually surprisingly recent, in 1854. As part of Russia’s Baltic fleet, galleys were deployed in the abortive attacks on the Finnish port city of Turku. As a last note of interest, it will no doubt surprise a few people to learn of the great mistake in the classic Charlton Heston movie Ben-Hur. Made a galley slave, our hero saved his commander when the ship sank. The problem here is that Roman galleys did not utilise slave labour on their oars. Despite the regularity throughout history with which slaves were made use of in oared ships, Roman galleys were rowed by freedmen except in times of dire emergency when manpower was lacking. Great stuff, Simon! Really enjoyed it. Absolutely amazing stuff. The most exciting fact for me was the depiction of Ptolemy Philopater’s galley. The sheer size is breathtaking and the stuff of legend. Thank you so much for such great information, Simon. Excellent article, Simon. Some real depth of detail in there. I was wondering if the device you described being used vs the Veneti was the harpax (though it is thought to have been a catapult-launched grappling hook as opposed to a solid ‘arm’)? And 7 rams? That’s just showing off! There’s an excellent analysis of the victory at Lepanto and of the socio-technological and economic factors that underpinned it in Victor Davis Hansen’s “Why the West has Won”.. Worth reading. Bookmarked for future reading. 🙂 Cheers. I’m glad that you mentioned the myth perpetrated in the movie Ben Hur — that slave labor was commonly used to man the galleys. So much of what we think we know we learned from fiction! 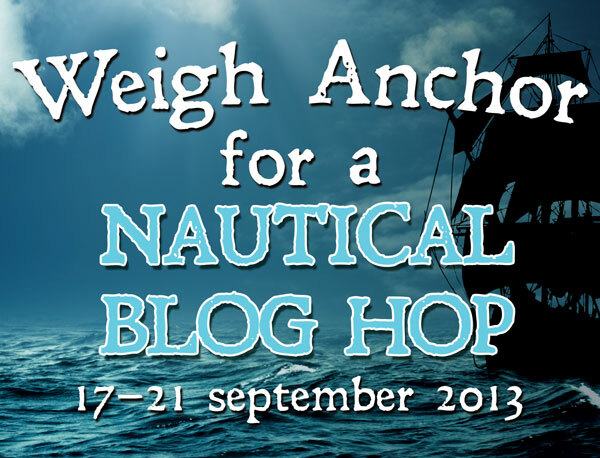 Thoroughly enjoyed this – and thoroughly enjoying the entire bloh hop! Leave it to a Ptolemy to go in for such ostentation! Fascinating, informative, and utterly enjoyable! Galleys are intriguing and impressive vessels. A whole world of their own. Thank you for this very interesting post.